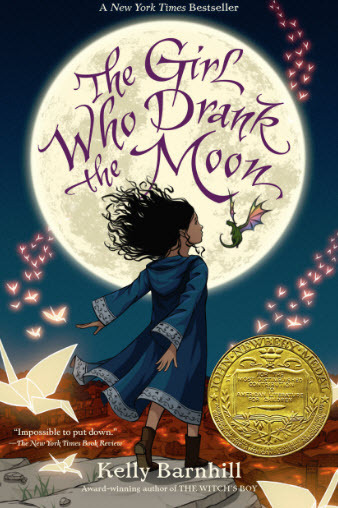 The 2017 Newbery Medal has been awarded to The Girl Who Drank the Moon by Kelly Barnhill. The book was published by Algonquin Young Readers, an imprint which was founded in 2013. This is the imprint's first Newbery award. The fantasy novel is about a girl who has an unusual upbringing: she is raised by a witch, a swamp monster and a Perfectly Tiny Dragon. Fox Animation has snapped up the film rights to the book. Newbery Medal Committee Chair Thom Barthelmess said of the book, "This compassionate, hopeful novel invites children everywhere to harness their power, and ask important questions about what keeps us apart and what brings us together." Publisher's Weekly spoke with Ms. Barnhill about her win, which she says left her absolutely gobsmacked. She explained that it took her a very long time to write the novel. The idea for the story came to her with an image: "of a poetry-quoting swamp monster with four arms and a big tail, holding a baby." She credits her editor, Elise Howard, for giving her that push to get started writing the story. She said Ms. Howard kept hearing her talk about her story idea and finally said, "Why don’t you just write it right now?" The 2017 Newbery Honor Books are: Freedom Over Me: Eleven Slaves, Their Lives and Dreams Brought to Life by Ashley Bryan, The Inquisitor’s Tale: Or, The Three Magical Children and Their Holy Dog, written by Adam Gidwitz, illustrated by Hatem Aly, and Wolf Hollow by Lauren Wolk.